Disclaimer: This drug calculator has been produced by the KIDS team, the BCH intensive care team and BCH pharmacists. The calculations have been checked by our team, but this calculator is released for your use with no warranty or support. Please always use the latest version from this site, rather than using a saved file. Always check the weight you have entered is correct. All calculations should be manually checked with an appropriate formulary (e.g. BNFc). KIDS and BCH take no responsibility for errors resulting from the use of this calculator. 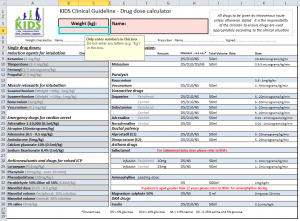 The KIDS drug calculator is in MS Excel format and you can click on the image to download the xlsx file. Please be aware that this had not been tested on tablets and smartphones and may not work on these devices. Please feedback with any questions or queries about Version 22 released on 24/04/2017. Kevin, Thanks for your comments. I have now fixed the rogue link!